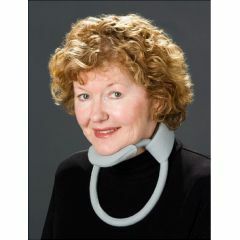 If you have been in an accident, or you are recovering from an injury, you may need to have a neck brace or a neck support pillow. Our site offers a wide range of products from various brands, and you can find just what you need here. Some of the different options available include orthopedic neck pillows, memory foam sleep pillows, soft foam cervical collars, cervical traction sets, a tracheotomy collar, cervical pillows and similar products. AllegroMedical.com offers the highest quality products and the best prices. See our Best Price Guarantee to learn more. Contoured Firm Foam Collar - Small - 3" x 15 1/2"